PIAA Japan's 2008 newest line (a.k.a. Forza Hybrid). 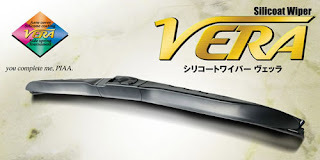 Its Aero Cover curvy design is considered to be PIAA's most beautiful wiper design so far but it also provides aerodynamic benefits like anti-lifting at high speeds and turbulence minimizing for fuel economy. It has this ingenious integrated side-spring frame design that forces the blade to hug the windshield with greater pressure than a standard wiper. The wiper frame itself features a powder-coat finish over zinc plating to resist rusting. Can use regular PIAA refills. This is the mother-of-all-PIAA-wipers. Certain non-Japanese imports may need the VH-1 Conversion Adapter.